* St. John Chrysostom, Homilia 17 (de capto Eutropi) PG 52.397. * The words „Ecclesiae Transylvaniae Delegato ac…” were deleted. When the Church is assailed she conquers: when snares are laid for her she prevails: when she is insulted her prosperity increases: she is wounded yet sinks not under her wounds; tossed by waves yet not submerged; vexed by storms yet suffers no shipwreck; she wrestles and is not worsted, fights but is not vanquished. Benedict Pictet was born on May 30, 1655 in an ancient family of Geneva, a son of the senator and councillor (syndicus) Andreas Pictet. He was educated by his uncle on his mother's side, François Turrettini (1623-1687), then at the age of 20 he travelled, with the later Geneva professor Antoine Léger (1652-1719) throughout France, the Netherlands and England. He graduated in Leiden, under the chairmanship of Friedrich Spanheim (1632-1701). After returning home he became preacher in Geneva. In 1686 he followed his uncle in the office of professor of theology, and from 1710 he was also the pastor of the Italian community. He became a member of the English Society for the Propagation of the Gospel in 1706, and of the Society of Science of Berlin in 1714. He died on June 10, 1724. His most important works are: Traité contre l'indifference des religions, Neuchâtel, 1692. Genf, 1716. – La morale chrétienne, ou l'art de bien vivre. Genf, 1693, 1696. 8 tom. – De consensu, ac dissensu inter reformatos, & Augustanae confessionis fratres, dissertatio. Amsterdam, 1697. – Medulla theologiae christianae didacticae et elenchticae. Genf, 1711. – Medulla ethicae christianae. Genf, 1711. 1712. – Of his work Dissertation sur les temples, leur dedicace et plusieurs choses qu'on y voit (Genf, 1716) our Library keeps a unique copy provided with thick handwritten annotations by the author himself, probably prepared for a never realised second edition. 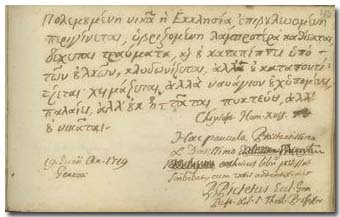 The deleted words of the dedication indicate that Benedict Pictet regarded the owner of the album as an emissary of the Reformed church of Transylvania: Ecclesi[arum] [?] Transylv[aniae] Delegato, ac … – A correction in the same vein can be seen in the dedication of Jean Alphonse Turrettini, written in the same day (p. 249).